3KD Switch Disconnectors. Reliable Safety. The new 3KD switch disconnectors provide reliable protection for personnel and ensure high system availability - in buildings, infrastructure and industrial plants. With these switch disconnectors you can implement your projects more efficiently and thus safeguard your competitiveness. The 3KD switch disconnectors are designed to systematically avoid electrical accidents. For example when maintenance work is being carried out on machines, you can help to prevent unauthorized operation by means of appropriate locking functions. The terminal covers of the 3KD switch disconnectors ensure enhanced touch protection and prevent electric shocks. Thanks to transparent contact covers, contact positions are clearly visible at all times. The 3KD switch disconnectors provide fast and easy installation. Additional functions can be retrofitted at any time - thanks to their modular design and a comprehensive range of accessories. Easy ordering and fast delivery also contribute to optimized stockkeeping. You therefore benefit from reduced time and low costs. You can even work much more efficiently during the planning phase: You will be provided with all the CAx data relevant for the entire engineering process. The wide variety of applications of the 3KD switch disconnectors will enable you to satisfy all your requirements - whether as main control-, EMERGENCY-STOP- or maitanance switches. 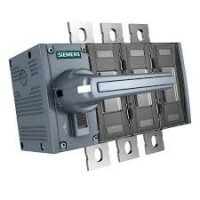 This is supported by a large selection of possible connection methods and operating mechanism designs and the comprehensive accessories.